Gregory P. Gilbert, Air Power Development Centre, review of Andrew S. Erickson, Lyle J. Goldstein, and Nan Li, eds., China, the United States, and 21st Century Sea Power: Defining a Maritime Security Partnership (Annapolis, MD: Naval Institute Press, 2010), Headmark: Journal of the Australian Naval Institute (May 2011). Each year there is one book that stands out from the pack. China, the United States and 21st Century Sea Power is a book that needs to be read by every member of the Australian Naval Institute, not only because it provides a blue-print for naval policy in the Asia-Pacific Century but also because it is one of the few authoritative works that discusses a cooperative alternative to the sensationalist threat driven responses to the rise of China. 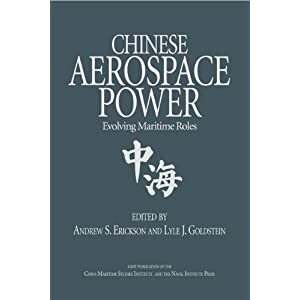 The collection of papers contained within China, the United States and 21st Century Sea Power are derived from the US Naval War College’s China Maritime Studies Institute’s third annual conference, ‘Defining a Maritime Partnership with China’, held in Newport, Rhode Island on 5-6 December 2007. Most of the papers were updated after the conference and a few additional chapters were added to round out the book. The result is a remarkably insightful work that should set the conceptual agenda for maritime engagement between China and the United States (US) for years to come. … Each chapter is prepared by a subject matter expert writing authoritatively, thoroughly and precisely, even though the language itself often has subtle differences in meaning between the equivalent English and Chinese translations. The editors have allowed each chapter to speak for itself, retaining cultural nuances which add considerably to the overall work. 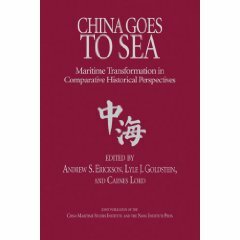 The result is a volume that discusses the advantages and limitations of US-China maritime cooperation, which should help policymakers of both nations to chart a course for ‘peaceful development’ for this century. Overall, the book makes clear that the US and China now have a great opportunity to increase naval cooperation, particularly with maritime security and humanitarian assistance. The release of A Cooperative Strategy for the 21st Century Seapower, by the US sea services in 2007, has been received positively as a step towards future cooperation, even though that cooperation may be bilateral when dealing with China. A Global Maritime Partnership (GMP) which includes China is still some way off – as is evident from the Chinese decisions to opt out of the Proliferation Security Initiative (PSI) and not to join CTF 150 when conducting anti-piracy patrols off the Somali coast. 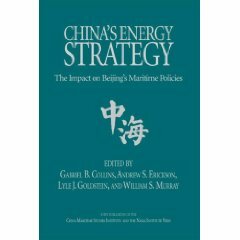 Although it is not possible to discuss every chapter of the book in this review, a few highlights will illustrate the scope of China, the United States and 21st Century Sea Power. The first chapter by Zhuang Jianzhong effectively sets the scene. He is convinced that US-China cooperation in maritime issues should be in line with China’s overall ‘peaceful development strategy’, as both nations aim to ‘build harmonious oceans and a harmonious world’. Yu Wanli, after summarising the evolution of Chinese naval strategy, states that ‘few scholars publicly declare that the development of the Chinese navy aims to challenge US supremacy at sea.’ He discusses China’s 2004 national defence white paper and its concept of ‘safeguarding national development interests’, and recognises ‘that China’s “peaceful development” is realized by participating in the existing international system and economic globalization.’ Such statements are reassuring, but as other chapters point out, the Chinese language of hedging is not always reflected by actions. Transparency and reciprocity issues are raised a number of times in the book, but even here Eric McVadon points out that much of the US concern may be due more to their not liking what they see from China than to a lack of transparency. It may also be appropriate to reflect upon how hedging language in Australia’s recent Defence White Paper is interpreted overseas, particularly in China. Chapters dealing with maritime commercial partnerships, search and rescue cooperation as well as humanitarian and disaster relief operations, highlight just how far US-China maritime security cooperation has come in recent years. In an especially informative chapter, Andrew Erickson examines views on America’s new maritime strategy as published in China. After describing areas of growing cooperation, he lists some of the obstacles to enhanced cooperation between China and the US; the Taiwan situation, the US use of military power projection, non-transparency, and recent incidents/crises. ‘Despite the long-term strategic importance of cooperation, perceptions and misconceptions will continue to wield great influence over its success’. That said, Erickson also believes that China’s rhetoric is hedging, while actual maritime cooperation proceeds quietly. Again the reader is left feeling cautiously positive about the future. Some of the major differences between China and the US involve maritime legal issues, especially over the interpretation of maritime zones under the Law of the Sea Convention. The chapters by Julia Xue and Peter Dutton analyse areas of common ground as well as the major differences. The large number of disputed maritime claims, made by China, remain potential sources for international conflict, although the Chinese policy of shelving such disputes is a pragmatic, albeit short-term, solution. The chapters by Wu Shicun and Zhu Huayou describe the opportunities for regional security cooperation in the South China Sea, an area which is of great strategic importance to most Asian nations, but particularly to ASEAN and Australia. James Holmes and Toshi Yoshihara also provide a good synopsis of the strategic relationship between the US, China and India in the Indian Ocean. Some defence analysts continue to see the rise of China in this century, as a modern version of the Anglo-German rivalry of the early 20th Century. Germany’s economic prosperity helped to fund an expanded Imperial German Navy with a global outlook. The British, as the only global sea power, felt threatened by Germany and became involved in a naval arms race that many historians believe was one of the causes of World War I. One would hope that today we would not wish to repeat such a nightmare scenario in the Pacific. It is a little surprising that the other example of naval rivalry during the early 20th Century is often overlooked. From the late 1890s, a rising United States competed with the British Empire for global markets. The US Navy grew rapidly in size and ability, in cooperation with the Royal Navy during 1917-18, and eventually the US replaced Britain as the maritime hegemon. Using Gabriel Collins’s step-wise diagram of maritime security cooperation (p. 33), which ranges from ceremonial visits to full interoperability, we note that the Royal Navy was at the bottom step even though it conducted ceremonial visits with the Imperial German Navy right up to the start of World War I. By the end of that war the US Navy battlefleet was operating as a fully interoperable component of the British Grand Fleet, and thus the US Navy/Royal Navy engagement was at the top step of Collins’s diagram. Today these likely alternatives are at the extreme ends of the spectrum when considering the future relationship between the US Navy and the PLA Navy, but they are certainly worth considering. 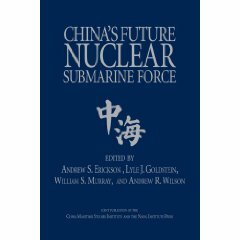 China, the United States and 21st Century Sea Power is a positive, balanced, thought provoking, and timely study which will no doubt impact upon the relationship between China and the United States over the next twenty years. One thing is certain, that relationship will also directly affect Australia and Australians. This book is highly recommended.